"See the fig tree, and all the trees. When they are already budding, you see it and know by yourselves that the summer is already near. Even so you also, when you see these things happening, know that the Kingdom of God is near." This was not one of my more familiar parables! But when I read it connections rang out and suggested a possible new meaning to an unsolved dream I had in 2003 with symbols that had never appeared before. In the dream a Spiritual Master appeared and saved me from getting stung by bees. Then several magnificent, large, mature fig trees appeared in my yard. They were full and heavy with figs – almost ripe. Years later I read a Hindu Sadguru’s talks. He uses the fig as an example of a complete form - a unique fruit, a simile to life when a spiritual aspirant turns inward and grows into the inner world. But my understanding was still incomplete until I saw a scientific documentary that included the fig. It said that the fig is not really a fruit, but the container of both the flower and seed encased inside. The host broke one open and there was a flower. In the early stage of some species the fig has been compared to a secret garden with hundreds of microscopic white flowers and a delicate perfume within. The only way the enclosed flowers can be pollinated is by a fig wasp. Some species are so small one can fly through the eye of a needle. They enter through a tiny ‘gate’ that the fig opens, then quickly closes after several wasps have entered. Bees collect the sap. There are so many spiritual symbols here – although presented from a new angle! According to the Gospel of Luke this parable conveys Jesus’ message about the coming of the Kingdom of God, which is within (and without) - like the fig. He told them: "Look at the fig tree and all the trees. When they sprout leaves, you can see for yourselves and know that summer is near. Even so, when you see these things happening, you know that the Kingdom of God is near. Among the many cultures and religions that use the fig tree as a symbol, the most familiar may be the Bodhi Tree - a large and very old Sacred Fig tree under which Siddhartha Gautama, the Buddha, achieved enlightenment. In India the banyan and peepal trees, both varieties of the fig, are the most revered and considered ‘trees of life’, or immortality in many Hindu scriptures. All of which echo the same message that the Kingdom is within. The day before the dream I had been reading ‘Mystical Dimensions of Islam’ and was intrigued by a statement in the Epilogue: “waiting for a sign that He is there.” Before going to sleep I decided I too would wait for a sign. 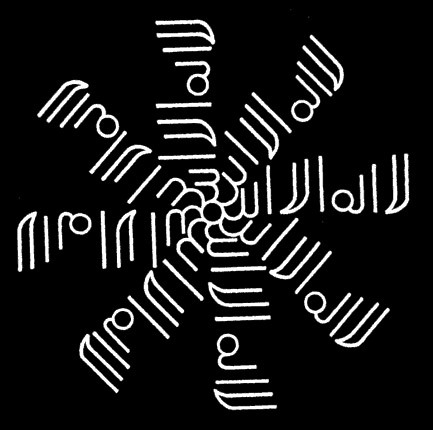 In Islam, both in its exoteric and esoteric tradition, Sign is an extremely important concept. The teaching parables of Christ are embed with many of such signs, and at the same time they speak about signs that point to the phenomena of reality. Sanureehim Ayatina fee al-afaqi wafee anfusihim. We shall show them Our Signs on the horizons and within themselves. The horizon represent the outer and the self (anfusihim) is what is within - both landscape are like canvas upon which the diving signs are drawn. For the gnostics, the reality outside is not forsaken since they are the most immanent and guiding path to realize the Presence. Thus the tendency to reduce everything by only metaphorical, only inner is not the way of the wise. Both the inner as well as the outer receive appreciation, attention and function as sign-posts along the journey of the seeker. In Quranic appreciation of reality, everything in the manifest world is a Sign of God, everything is stamped by the signature of the Fashioner (al Muswawwir) who fashioned with truth (bi al-haqq). The Surah or the Chapter of the Quran, interestingly is named as Fussilat, which means Explained in Details and the verse of Sign is placed significantly towards the end of the Surah. A servant of God once said, "Everything in the creation is a metaphor for the Beloved." Figs are considered characteristic fruit for the land of Palestine. Significantly in certain gnostic teaching the fig tree belong to the meaning of sexual forces. And sterile fig tree represent the abuse of sexual energy, fornication, the profanation of the sacredness of human sexual union. To Christian gnostics the sterile / barren fig tree is cursed by Christ because of its unworthiness as well as its abusing its purpose and power. Because of the peculiar form of the flower of figs, ancient Indians regarded the fig as a flowerless tree. Buddhist and Hindu texts sometimes refer to 'seeking flowers in a fig tree' to indicate something that is pointless or impossible, or to indicate the total absence of some quality. References to the flowers of a fig may also be used to indicate great rarity. In the context in which the parable is spoken, specially coming from one of the representative of the Children of Israel, Jesus Christ, someone who grew up in the Jewish tradition with all its symbols and intertwined meaning understood very well that Olive and Fig represented two of the most important symbols of Israelite nation. The Olive tree represents the House of Israel. The Fig tree is also associated with the House of Israel but has some important and distinct feature about the House of Israel. Leaves make the tree appear full, but they are designed to prepare the way for fruit. But, without fruit, regardless of how many leaves it has, the fig tree is barren. The leaves represent faith, words, beliefs. Belief and faith are to lead to the ones who believe and have faith to righteous action, to good deeds. But if all there are is words (all leaves), and nothing is reflected in action, nothing is there in embodiment (no fruit), then its all reduced to hypocrisy. If placed in the socio-religious context, during the time of Christ the Israelites had the Aaronic priesthood, but it became like corpse devoid of soul because of its corruption from within. The law of Moses, with it's priesthood, was meant to guide and recognize the Messenger of the age, which it utterly failed. They claimed they have been waiting for the Messiah, every morning and night they prayed with their words that the Savior be sent; yet when the Messiah appear to them, they not only reject him, but also plot to kill him. Thus, as a nation, they were full of leaves (the priesthood) but barren of fruit. Apply it to our individual reality, the leaves are our faith, beliefs, words, prayers where as the fruits are the action, the embodiment of our action in our living, the transformation of words into action in the world. The leaves are also our intellectual knowledge about what is right and what is wrong, what is truth and what is falsehood; whereas the fruit is to conduct the right and avoid the wrong, to be just and shunning the unjust, to embody truth and turning away from every falsehood. May God forgive our imperfections; bless and accept our good deeds. "See the fig tree, and all the trees"
In the parable, tree is an important element which Jesus uses to enclose divine wisdom about the action of budding new leaves and how one manifestation is a sign-post to another to come. In this case is a sign of a season to arrive. The Tree of Life is a concept known from ancient times, for the tree is rooted in the earth and reaches the sky, thus belonging to both spheres, as does the human being. The feeling that life power manifests itself in the growth of a tree, that leaves miraculously sprout out of bare twigs and fruits mature year after year in cyclical renewal, has impressed and astounded humanity through the ages. Hence, the tree could become a symbol of everything good and useful and the Koran states, for this reason, that 'a good word is like a good tree' (Sura 14:24). Trees are often found near saints' tombs: the amazing the number of trees connected with the name of 'Abdul Qadir Gilani in Sind was mentioned by Richard Burton and others. it is natural that Paradise, as an eternal garden, should boast its very special trees, such as the Tuba, whose name is developed from the greetings 'Happiness', tuba, to which pious people who believe (Sura 13:29)' that is, the Tuba tree is the personified promise of eternal bliss hat one hopes for in Paradise. Likewise, the boundaries of the created universe are marked by the Sidra Tree, mentioned in Sura 53:14 - The 'Lote Tree of the farthest boundary', which defines the limit of anything imaginable; and it is at this very Sidra tree where, according to legend, even the mighty Gabriel had to stay back during the Prophet's heavenly journey while the Prophet himself was blessed with reaching the immediate Divine Presence beyond Where and How. Thinkers and mystics could imagine the whole universe as a tree and spoke, as did Ibn 'Arabi, of the shajarat al-kawn, the 'tree of existence', a tree on which man is the last, most precious fruit. On the other hand, Bayazid Bistami, in his mystical flight, saw the 'tree of Unity', and Abul Husayn an-Nuri, at about the same time, envisaged the 'tree of gnosis', marifa. A detailed account of the 'tree of futuwiwa', the 'manly virtune' as embodied in later futuwa sociaties, is given in the fifteenth-century Turkish work: the trunk of its tree, under which the exemplary young hero lives, is 'doing good'; its branches are honesty; its leaves proper etiquette and restraint; its roots the words of the profession of faith; its fruits gnosis, ma'rifa, adn the company of the saints; and it is watered by God's mercy. This is reminiscent of the Sufi shajara, the 'family tree' that shows the disciples their spiritual ancestry, leading back to the Prophet, drawing - often of enormous size, symbolize the continuous flow of Divine guidance through the past generations, branching out into various directions. The close connection between the tree and life, and especially spiritual life, is beautifully expressed in the hadith, according to which the person who performs the dhikr, the recollection of God, is like a green tree amid dry trees - a likeness which makes the Muslim reader think immediately of dry wood as fuel for Hell, as it is alluded to in the Koranic curse on Abu Lahab's wife, 'the carrier of fuel wood' (Sura 111:5). every twig that's not dry begins to move in dance! 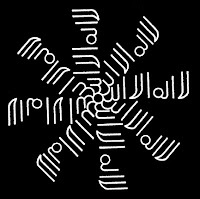 The Tree of Life, whose branches are the Divine Names, is rooted in the Divine Presence, or else, the profession of faith can be seen as a tree whose outer rind, formed by the negation, "la", is pure negativity, and whose sap flows through "h", the last and essential letter of Allah. The fig as fruit, as mentioned earlier has its flower and seed encased within. 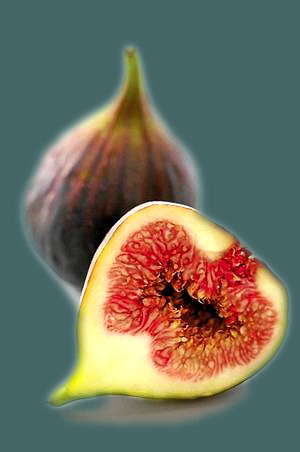 Look at the shape of the fig when its cross sectioned. It is the shape of the heart. The core of human being is the essence that is within his inner heart. 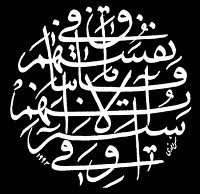 It is where all secrets (Qalb, Sirr, Ruh, Khafi, and Akhfa) are deposited. The scientists say, within the fig is an entire microscopic garden. In the early stage of some species the fig is like a secret garden with hundreds of microscopic white flowers and a delicate perfume within. The gnostics say, human being is the micro-cosmos, all that is in the macro cosmos are to be found within the Adamic manifestation. The only way the enclosed flowers can be pollinated is by subtle and small sentient beings, some species are so small one can fly through the eye of a needle. They enter through a tiny ‘gate’ that the fig open for some precious moments only. Behold the precious opening of the heart! Have we not expanded your inner heart? The opening of the heart, as transmitted by the Sufis is given by the Grace and is precious precious moment for the servant. The Sufi mystics know about making the soul pregnant with God-Consciousness. Like the precious and tiny opening of the inner world of the fig, the grace of God enters into the soul. This is one of the meaning of the deeply mystical Quranic verse, "waiAAlamoo anna Allaha yahoolu bayna almar-i wa qalbihi", '... And know that Allah cometh in between human and his heart ...' (8:24). O Sole Being! O The Most Subtle! But this entering is preserved for those who preserve themselves and give their mind, heart and soul to God. And indeed only few are they in the world. If we go back to the parable of Jesus and trace it back to the original discourse in which this parable was mentioned, we find that Christ was mentioning eschatological signs: the signs of the last days, the end time of creation. 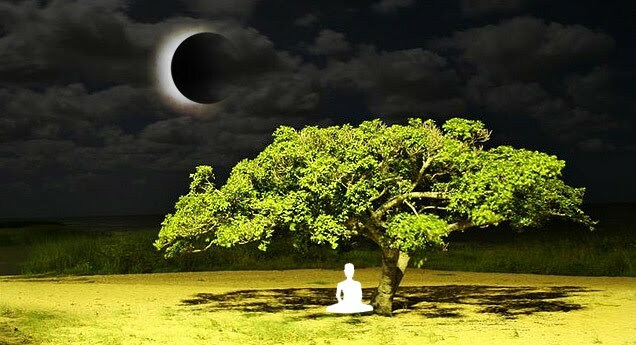 Jesus himself perhaps was sitting under a fig tree while teaching to his companions, a similar tree under which Buddha received his illumination. This time it was the blessed companion of Jesus who were drinking from the fountain of wisdom and grace that flows from being and sitting in the presence of a realized master and their wisdom words. In earlier of the discourse Christ goes in detail about the external signs of the last age. These signs are again refreshed by his brother in the chain of prophetic brotherhood, Prophet Muhammad, upon them both be peace and blessings of God. The only miracle of annihilation of Christ was to make a barren fig tree - wither and die. Every other miracle of Christ was either to provide nourishment (healing) or giving life (raising from death, giving life to clay birds) by the permission of God, but this was the only opposite recorded in the tradition. The incident is prone to misunderstanding to the uninitiated mind, while it hides within it the secret of God's role as the Source of Grace as well as the Source of Vengeance, God is both the giver of Life and giver of Death (yuhi wa yumit). Jesus said, "Ye shall know them by their fruits. Do men gather grapes of thorns, or figs of thistles? Even so every good tree bringeth forth good fruit; but a corrupt tree bringeth forth evil fruit. A good tree cannot bring forth evil fruit, neither can a corrupt tree bring forth good fruit. Every tree that bringeth not forth good fruit is hewn down, and cast into the fire. Wherefore by their fruits ye shall know them. Not every one that saith unto me, Lord, Lord, shall enter into the kingdom of heaven; but he that doeth the will of my Father which is in heaven" (Matthew 7:16-21). Then render him the lowest of the low. Except the ones who believe and do righteous deeds: for they shall have a reward unfailing. Then who after this, can deny about the Judgment (to come)? Is not God the best of judges (Alaysa Allahu bi-ahkami al hakimeen)?